Can we maximize the effect of your storytelling? As we saw in our previous post, you’ll have to talk to a niche, not to everyone. As every story, you need a good concept, or idea, to begin with. However, the needs of a company are different to another one. It’s impossible to create general rules for that, but we can advise some tips that can help in creating the story itself. In first instance, making storytelling means that a voice has to speak; in other words, it’s necessary to create a character. But not a normal one as you can see in TV ads. This character has to be interesting to the readers’ eyes, with its strengths and weaknesses. And because the readers have to identify themselves with the narrator, the character can’t be too perfect. If it would be perfect, it will be complicated to involve any reader; nobody will love it. The character has to talk about its emotions, its ambitions, its projects, its preferred things and the hated ones. Public has to appreciate the way the character puts itself on the line. They are all things that let the character to be closer to the readers. The storyteller has to bring it to life, so that the public – at least the one of your niche – shares emotions with him. The worst thing to do, is to create a character that doesn’t create any emotion in the readers. The story has to convey a message inside. To do it, the storyteller has to assume a clearly identified point of view. To make a long story short, it’s not about communicating just to pass the time, but for a precise aim. The message has to be clear and precise. The narrator should tell the story as though he had really experienced it in first person. 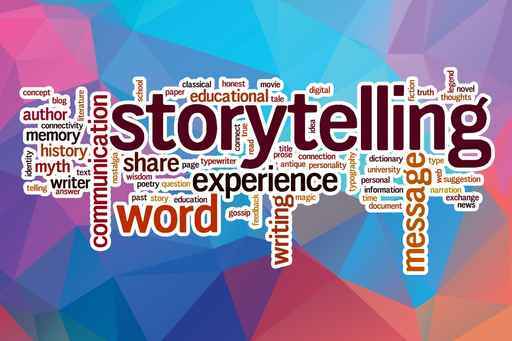 Among other things, telling a story that can really happen to everyone gives to the readers the feeling of being genuine, reliable and distinguished. Real facts have to be told, not fictional. Storytelling gets its maximum efficiency if the stories that are told are real. If this is not your case, at least make sure that your stories are plausible. It has to be very persuasive. The stories have to convince your target and let it act! It must be really convincing. To be convincing, the story has to be full of details. And they have to be precise. The story has to convey sincerity and legitimacy. The aim to sell something to someone must not be seen in any way. It has to touch emotions of the niche public. Many researches have demonstrated how an emotionally-involved public is more inclined to shop than a bored audience. The readers will have to feel the need to share your story with all the people they know. This kind of engagement is very important, especially if the company do storytelling on the social networks. The story has to be remembered by the readers. If you read a story and then forget about it immediately, it’s not a sign of a good storytelling. On the contrary, a storytelling that works is remembered for a long time. It has to create a real bond between the brand and the company, or the the single person and the readers. This is eventually the real value of storytelling: create a strong relationship between the parts. More tips and advice will follow.